This 3x4m stand installed at a Manchester show is an excellent example of how to beef up your stand space and make it stand out from the rest especially when you are surrounded with shell scheme in the halls. The clever use of company graphics really made an impact with this simple but very effective stand and provided an eye catching and attention grabbing back drop. Lighting installed on the top of the back and side walls [highlight color=”green”]flooded the stand with light[/highlight] and boosted the overall presence of the stand. A lockable storage cabinet was placed on the side wall to enable the client to lock away valuables and product literature during show closing times. 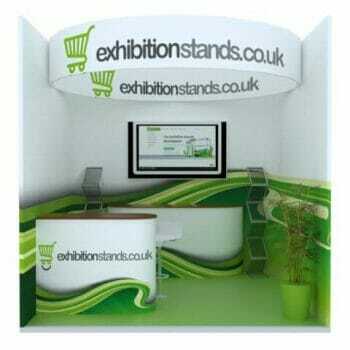 A reception style counter was placed at the front of the stand which was a focal visitor point and allowed staff on the stand to chat to potential customers about their products and services, as well as being able to display ‘giveaways’ and hold a computer for staff to use to gather information. Two high bar stools worked well behind the front counter. A screen was placed on the side wall which connected to the computer and allowed the client to show presentations during the course of the show. A literature rack was strategically placed at the other side of the stand holding literature and bags which the client gave away to visitors. The whole stand was sat on a wood vinyl flooring, finishing off the professional and quality look. 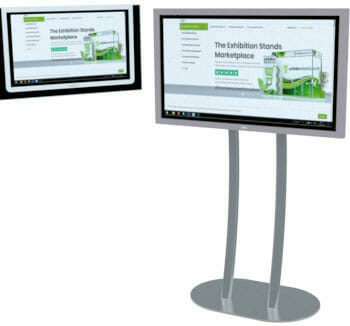 The client was very happy with their quality and cost effective display!